Four new Mame Sengoku Basara 4 acrylic straps are due for release in late January 2015. Priced at ¥648 each, there will be designs for Date Masamune, Ishida Mitsunari, Shibata Katsuie and Shima Sakon. 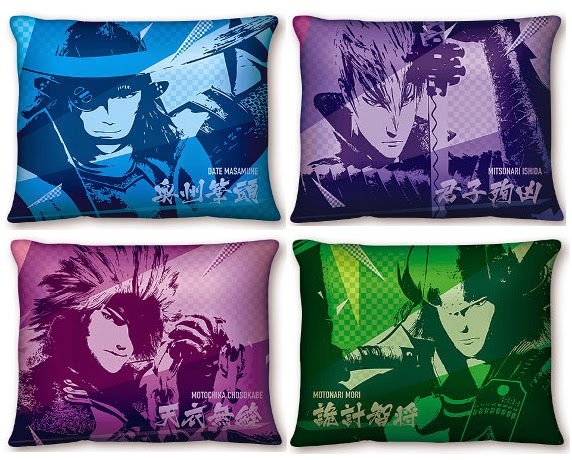 In addition, AmiAmi have added details of four Sengoku Basara Magazine cushions for release in late January 2015. 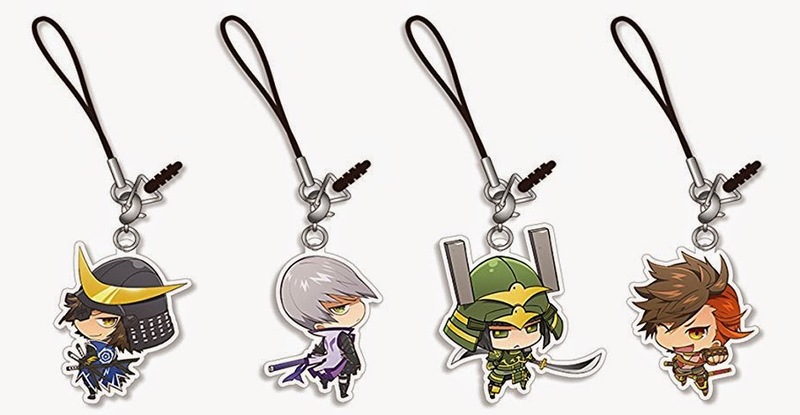 They're priced at ¥3,240 each and come in a choice of Date Masamune, Ishida Mitsunari, Chousokabe Motochika and Mouri Motonari designs. 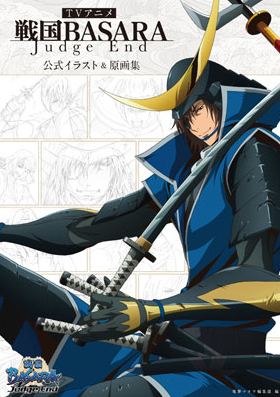 Masamune seems to be casually reclining and with his weapons. Presumably Yukimura is on the back cover - I wonder whether he'll look as relaxed as his rival? Having trouble buying Sengoku Basara Magazine? In response to a request (and because I still haven't figured out how to respond to comments on Tumblr), some people are having trouble finding ways to preorder the upcoming Sengoku Basara Magazine vol. 7 outside Japan. It seems that most import stores still haven't posted their listings, but if you're worried about missing out and don't mind the more expensive shipping, Amazon Japan and HMV will both ship the magazine overseas and accept foreign credit cards. I'd expect stores such as CD Japan to list the magazine too eventually. It might be worth contacting your favourite websites with a link to the Amazon page to ask when they'll be adding their listings! After the last batch of information was released with the cover illustration, the magazine shot up to first place in Amazon's gaming magazine category and has been in the top ten ever since. It's possible that it will sell out quite quickly after release. Enterrise, the company behind this year's Pachislot Sengoku Basara 3 slot machine game, have posted a generous batch of wallpapers on their website which highlight several characters from Sengoku Basara 3. There are some older Pachislot Sengoku Basara 2 pictures available too if you prefer Tsuchibayashi Makoto's character artwork to the CG renders. This last section isn't news but a request for help from a fellow Sengoku Basara fan! Matsunaga Hisahide recently got in touch with me to ask whether I knew anyone who would be interested in teaming up with him to translate the cutscenes from Sengoku Basara 4 into English. Fans may already be familiar with his work from the subtitled promotional videos he shared leading up to the game's release as 'PSandNintendFreak' on YouTube, as well as content from previous titles. Those videos were a collaboration with longtime series fan Nine Demons Yoshitaka, but due to real life commitments Hisahide is currently looking for more helpers to provide translated scripts for the dialogue so he can match it up to video footage and help fans who don't speak Japanese to get more out of the game. He's completely flexible about who shares the videos and full credit will be given; he just wants to get the content out there! If you're interested and have enough free time to assist, you can contact Hisahide directly through Koei Warriors or YouTube - or send me a message and I'll provide more details and help you make contact.